AV.io 4K has no drivers to install? How does it work then? AV.io 4K uses USB Video Class (UVC) and USB Audio Class (UAC) drivers. These drivers come with the operating system, meaning there is no software for you to install and configure! Since AV.io 4K has no driver software, what do I need to capture video content? To capture video content with AV.io 4K, you will need a software application that works with UVC hardware. Some such applications are native to certain operating systems, while most others need to be downloaded and installed from a third-party source. Nearly every application that works with web cameras works with UVC hardware like AV.io 4K. Are there any configuration options at all with AV.io 4K? Available through the Downloads page, AV.io Config allows users several basic configuration options. Users can enable/disable special capture frame sizes, select the audio pair for capture, set aspect ratio preservation, choose power-saving performance mode, and update firmware on their AV.io 4K device. Can I capture DVI signals with my AV.io 4K? The HDMI port on AV.io 4K only supports digital signals, specifically HDMI and DVI-D, which means that only digital DVI is compatible. To capture analog signals such as DVI-I, VGA or SDI, try using AV.io HD, DVI2USB 3.0, DVI2PCIe Duo or a capture and streaming system like Pearl-2. Can I capture VGA with AV.io 4K? No, AV.io 4K doesn’t support analog signals, only digital. 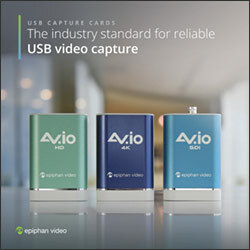 For VGA capture, select AV.io HD, DVI2USB 3.0, DVI2PCIe Duo, or a capture and streaming system like Pearl-2. Can AV.io 4K save captured signals as a movie? Using any third party application that supports UVC capture devices, you can save your captured content as either images or as a video (depending on the options available in the 3rd party application). For example, using VLC you can easily save your HDMI signal as a video on your computer. What interface is needed for AV.io 4K? AV.io 4K connects to your computer via USB. It works best with USB 3.0 (SuperSpeed), but can also work with reduced performance (and without audio capture) when plugged into a USB 2.0 port. USB 3.0, also known as SuperSpeed, comes standard on all computers manufactured after 2011. You can often identify which USB port on your computer has USB capabilities by checking the symbol. Often, it will be blue, or be attached to the letters “SS”. If you’re still not certain, check with your computer or motherboard manufacturer to verify that USB 3.0 is present on your system. How many frames per second can AV.IO 4K capture? AV.io 4K captures video at 60 fps for any resolution up to 1080p unless the application specifies a different frame rate. Does AV.io 4K scale or reduce the resolution of the images it captures to transfer to the computer? That depends! For example, if the source input resolution is smaller or larger than the output resolution selected by the third-party application in use, then capture resolution will be affected accordingly. As well, AV.io 4K has a list of input resolutions that it is able to accept. This includes all common resolutions, but if yours is not on the list, the video may be stretched or scaled and letter-boxed. To find out what that list is, check here. Does AV.io 4K work with operating systems not listed in the technical specifications? Because AV.io 4K uses USB Video Class (UVC) and USB Audio Class (UAC) drivers, it should work on all UAC/UVC compatible operating systems. However we only test and support the subset of OS’s listed in our technical specifications. Can I use different video sources with AV.io 4K while maintaining the same capture signal? Yes. Unless you have changed the advanced configuration settings, you can change your video source (e.g. change what is plugged in to the HDMI end of the AV.io 4K) and video capture will not be paused or interrupted. The exact content of captured screens while nothing is attached to the HDMI port is not guaranteed. The video output resolution that I want is not listed in the list of supported modes for AV.io 4K. Can AV.io 4K capture at this custom resolution? Yes. Using AV.io Config, you can configure AV.io 4K to add the exact resolution of your input signal to the list of supported output resolutions. If the capture application chooses this resolution, AV.io 4K will capture video at this special resolution. Can I connect more than one AV.io 4K device to the same computer? You can connect up to 4 AV.io 4K devices to the same computer, however the USB bus can become overloaded, causing reduced capture rate (fps). Test with different USB ports to determine the limits specific to your computer’s configuration. Does AV.io 4K use frame compression when capturing video content? No, AV.io 4K sends uncompressed video to the capture computer. Compression may happen when you save the signal as a video (e.g. when you save with a codec like H.264). Will AV.io 4K have firmware updates? AV.io 4K will have occasional firmware updates. Customers who have registered their AV.io 4K will be notified via e-mail of any new firmware upgrades. The product registration page can be found here. What is the capture delay when capturing with AV.io 4K? AV.io 4K has near-zero latency (capture delay). However, third-party applications may introduce some delay. If low latency is important, test with various capture tools to find the one that introduces the least delay possible. Help! My image appears reversed in my capture application! This is just a visual quirk – image mirroring happens with most UVC-friendly applications. But don’t worry! All captured video content will appear correctly despite appearing reversed in your application! There are black bars on either side of my captured video content! How do I get rid of these? By default, AV.io 4K preserves the aspect ratio of your input signal by adding black bars to the sides or top and bottom of the frame if the application using the signal requests a frame size with a different aspect ratio. This aspect ratio preservation option can be disabled by using the AV.io Config tool found on the Downloads page. How do I know what resolution and frame rate my video source is outputting? When you use the AV.io configuration tool, it will automatically let you know what your video source is doing. Plug in your source and select the relevant device from the list. Check the status bar at the bottom of the window to see the exact resolution of the source (1920×1080p), the frame rate the source is outputting (60 fps), and the color model (RGB). You can’t always get this information easily from your video source, so check the configuration tool to make sure! Will the color space I'm using affect the outcome of my capture? For resolutions up to 1080p, you are able to choose between the color spaces NV12 (4:2:0), I420 (4:2:0) and YUY2 (4:2:2) without affecting the capture rate. For 4K resolutions, AV.io 4K captures color spaces NV12 and I420 at as high as 30 fps, and color space YUY2 at as high as 20 fps. What is the difference between DCI 4K and 4K UHD? These are just two different definitions of a 4K resolution. 4K UHD (3840×2160) is the standard 4K resolution available on televisions and other common display screens. The resolution of 4096×2160 is referred to as Digital Cinema Initiatives (DCI) 4K, and is the resolution used almost exclusively for cinema-scale film production. It is rare to find this resolution outside of a cinematic context. 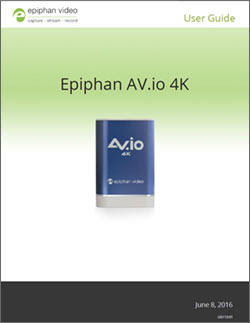 AV.io 4K supports input and output at either resolution. Your user guide recommends using Intel USB host controllers. Why is that? Our testing showed that only Intel USB host controllers had the necessary throughput required to sustain 4K video output. With other USB host controllers, the actual frame rate captured at 4K resolutions might only be 96%-79% of the expected frame rate, however, AV.io 4K will still work with any USB 3.0 port. These downloads give you access to the latest developments for your device. You can load this firmware onto your device using the AV.io Config tool. You can learn the full process for updating Firmware in our user guide. For most uses of AV.io 4K, the configuration tool is not required. However, it is necessary for installing new firmware, and for advanced usages such as creating custom resolutions. AV.io Configuration Tool. When installing on Windows 10, you may need to right-click the file and choose Run as administrator.